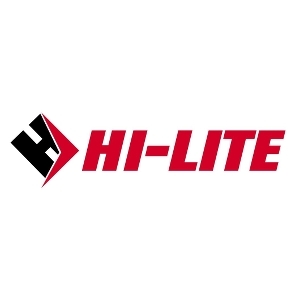 Hi-Lite is a global leader in airfield safety maintenance serving airports around the world. We offer innovative and sustainable maintenance solutions to maximize airport operations, safety and meet the stringent requirements of FAA Part 139 and ICAO Annex 14. Our core services include airfield markings, runway rubber removal, friction testing, and pavement maintenance. Hi-Lite is a centralized source of solutions with a full range of services in airside safety. By assessing the current conditions of an airfield Hi-Lite can offer the right solution. The company tailors programs to meet stringent airport requirements, adapt to operational schedules, and provide environmentally sound solutions. 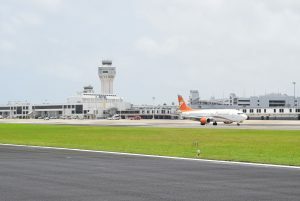 Creating a more efficient, sustainable airport, while ensuring the safety of the traveling public is the top priority of the entire airport community. In order to satisfy the demands of the airport of the future, Hi-Lite has created the AMS+ (Airfield Maintenance Services) program. AMS+ is positioned to alleviate constraints while helping airports reach their maximum potential. We are constantly evolving and adjusting to keep pace with industry needs and standards. Every day, our services enable airports to carry out efficient and safe airfield operations. In addition to safety issues, we are committed to helping airport operators achieve their corporate and regulatory missions. 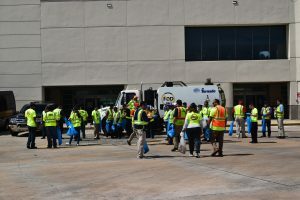 At Hi-Lite we prepare airports today for a successful tomorrow. 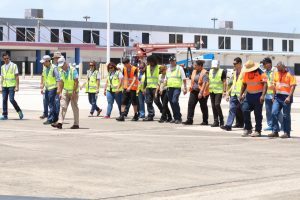 Undeniably, creating a more efficient, sustainable airfield, and ensuring the safety of the travelling public have been the priority on stakeholder’s agendas. In response to these issues and the increasing air traffic demand, Hi-Lite has developed the AMS+ (Airfield Maintenance Services) program, a fixed priced maintenance contract with bundled services focused on safety and ensuring FAA and ICAO compliance. 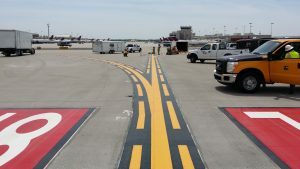 AMS+ is centered on the core components of airfield safety including a comprehensive airfield markings program, runway skid resistance management, pavement preservation, with options to include additional related services. These solutions enable airport operators navigate through the challenges of balancing compliance and budgetary constrains. Airports around the world are dealing with numerous critical safety issues brought on by increased traffic, budget restraints, and the absence of a long-term comprehensive maintenance solution. 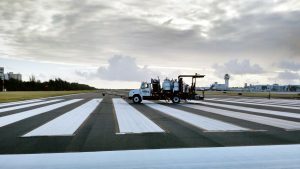 Multi-year contracting of airfield maintenance is a common solution airports have implemented to address their safety, compliance, and budgetary challenges. In addition to long-term contracting, an on-call contracting service strategy is another approach airports and state jurisdictions apply to standardize maintenance and compliance initiatives. AMS is an alternate strategy or in some cases supplemental approach to expensive airport equipment acquisitions. Working along with airport staff, the AMS solution contains all the aspects necessary to achieve safety and compliance. Given airports’ prominent status as the backbone to the transportation industry, Hi-Lite understands the importance of procuring a qualified contractor to execute critical airfield maintenance services. Markings, along with visual aids, play an important role for any airport to carry out safe operations with minimal disruptions. 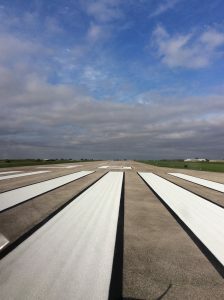 We specialize in all areas of the airfield including runways, taxiways, ramps, aprons, and gates. 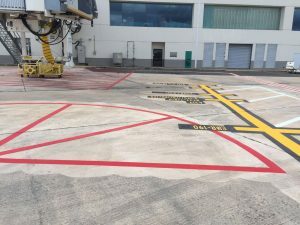 When planning an airfield markings project, the Hi-Lite team is a valuable resource due to our three decades of experience in horizontal signage. Every project is different and we can recommend the best solutions specific scopes of work. Some projects require certain surface preparation methods while others require complete paint obliteration and resurveying to comply with latest FAA/ICAO regulations. As the industry adapts to accommodate growth, Hi-Lite is a reliable partner airport operators can trust. Carbonized rubber deposits on airport runways cause a dangerous loss of friction making the touchdown zone slippery and hazardous, endangering the lives of pilots, passengers and the ground crew. 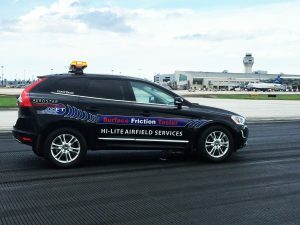 Hi-Lite has perfected the art of responsible runway rubber removal from airport runways and taxiways enhancing the safety of airfields around the world. Hi-Lite has dedicated itself to developing a variety of ways of performing high quality rubber removal including the R4 process, waterblasting and the chemical process. Hi-Lite uses AEROGREEN Runway Rubber Remover, a very effective chemical cleaning technology, in combination with the heavy duty scrubbing action, to dissolve the carbonized rubber residue build-up that can make the touchdown zone on airport runways hazardous. Hi-Lite’s custom built “Rubbernator” waterblasters can perform a six foot wide cleaning pass, removing up to 30,000 square feet of rubber per hour. The waterblasting equipment are equipped with rear view cameras, monitors and auxiliary lights for safe, productive, high quality work in all conditions, 24 hours a day, 7 days a week. Hi-Lite’s innovative R4 (Responsible Runway Rubber Removal) process is the most effective way to remove dangerous rubber from the runway surface. It involves pre-treating the built-up rubber on the runway with AEROGREEN Runway Rubber Removal followed by light waterblasting. Airplanes depend on friction between runway and tires to be able to safely land the aircraft. Over time, the skid-resistance of runway pavement deteriorates due to weathering, usage, aging and contaminants. The most persistent contaminant problem is deposits of rubber from tires of landing jet aircraft. 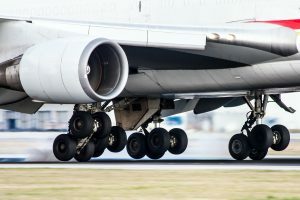 Heavy rubber deposits can completely cover the pavement surface texture causing loss of aircraft braking capability and directional control, particularly when runways are wet.